By Anna L. Davies ’19, an English major with a history minor. For the past three years, she has worked as an editorial assistant for University Communications and OWU Magazine. What excites her most about postgrad life is going to bed at 10 every night. And also getting a dog. As part of her duties as an intern with the Student Involvement Office last summer, Anna Davies carried luggage, slept too little, and gained some insights about her future. It was promoted as an internship doing event planning for summer orientation. It turned out to also involve running on three(ish) hours of sleep during orientation sessions, dragging boxes of bedding up the Welch Hall stairs after the elevator broke on freshman move-in day, as well as the eventual realization that I hate event planning. But the dry run to help prepare me for the “real world” before my senior year also turned out to be the best summer of my life. 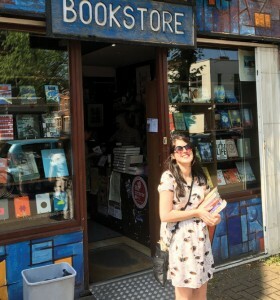 Freshman Anna on one of five travel learning courses she took while at OWU, this one to Belfast. Naturally, the English major found some books. 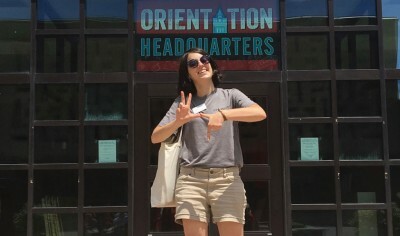 In 2015, as a new student at OWU meeting my orientation group, I was freshly moved in and freaking out because my parents had just left. I was completely alone for the first time in my life. I told everyone in my group how happy I was to be here, but obviously I was terrified. I pride myself on being an independent person, but I couldn’t help wondering how I was going to navigate starting all over again: no friends, academics much more challenging than I was used to, a dorm room shared with three other people, the slog of young-adult insecurity. That’s where my mind went when I filled out the application to be a student co-director. I did it for students like freshman Anna, who just wanted to hear she wasn’t alone and that feeling stressed and lonely was normal. I wanted to be the person who told new students to make the most of their first year, and to let them know that it only gets better from there. 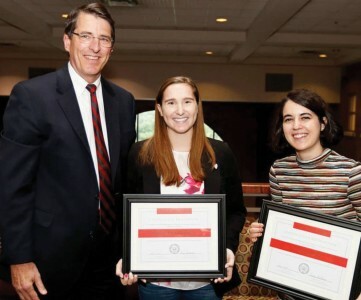 President Rock Jones helped recognize Anna (right) and her friend Penell Paglialunga ’19 for their work helping to plan orientation with “You Are OWU” awards in September. Different routes for the same life experiences. Every time I reassured an anxious student that he or she would find a niche here, I realized I was talking myself down from a crisis, too. It was cathartic — I had the leadership position, so I led with empathy. We’re all just trying to play like we have it together. What matters most is when we let the façade drop and collectively admit we have no idea what we’re doing, but we’re trying our hardest to get oriented in life. So as I step out into the unknown, I’ll carry the life lessons new students taught me: Show compassion. Be true to yourself. Believe and trust that things can only get better. And when all else fails, dancing outside Beeghly Library with 488 of your closest new friends during a new-student block party is a great option.